Ah, click Art Cars. We in Houston adore them. But what about those crazy souls elsewhere who also want to get their mojo on by turning their wheels into a rolling canvas? And what, really, were those art car artists thinking?! Filmmakers Ford Gunter and Carlton Ahrens’s first documentary, “Art Car: The Movie,” answers those questions and more in a film that is a rolling love letter to artsy autos. Showcasing cars in places like Corbin, Kentucky (where you can “eat in history!” at the Colonel Sanders Café), Gunter and Ahrens’ film has not only captured the art car world in all its glory but also has the side benefit of spreading the gospel of Houston art car love around the country. Buoyed by a well-received sneak preview at Discovery Green during this year’s Art Car Parade weekend, the two can’t wait to premiere their final cut as the closing film of the Cinema Arts Festival Houston on Sunday, November 13, 7 p.m. at Miller Outdoor Theatre. A + C writer and art car artist Sarah Gish chatted with Gunter and Ahrens who were in a frenzy finishing up. A + C: First of all, “Del Monte Films” because you both grew up on Del Monte in River Oaks? Are you trust fund kids or what? AHRENS: Our friend Randy likes to say that we grew up on the bad side of Del Monte. GUNTER: So we named it “del monte films,” with all lowercase. Keeping it real. A + C: How you did you guys decide to make a film about art cars? GUNTER: We were kicking around several ideas at the time, but the art car artists were by far the most approachable and visibly interesting, which is really key for first-time filmmakers. After a few months we started realizing we had a pretty damn good story, and a pretty damn good platform to tell the story of the American love affair with the automobile through these small groups of outrageous, dedicated artists. In the end, the decision was easy, and it was the right one. A + C: Does Harrod Blank make an appearance in “Art Car?” Has he been supportive of your film? GUNTER: Harrod is in our movie and he has been very supportive. 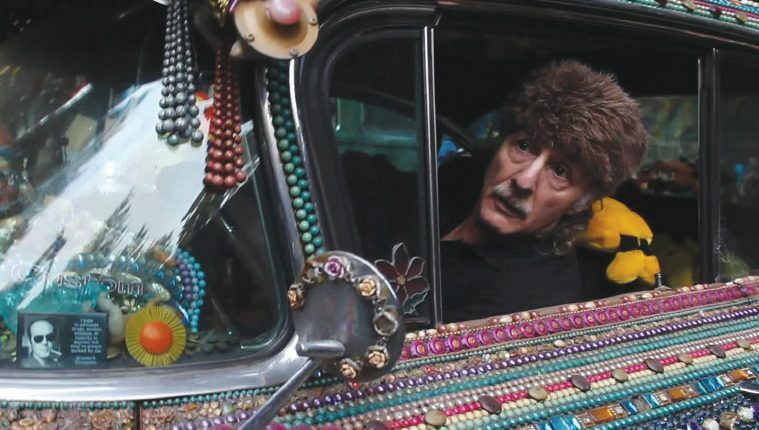 He’s probably the godfather of the art car scene, and a huge reason why Houston took off as an art car city, and our movie wouldn’t be complete without his participation. He’s a great guy and a kind soul, and I hope our professional and personal paths cross again. AHRENS: Harrod invited us out to his badass place in Arizona where he’s creating an incredible museum to preserve these famous art cars by artists from all over the country. He’s a pretty good spaghetti cook and we drank some wine and shared battle stories. We’ve learned a lot from him about art cars and filmmaking. A + C: I’m an art car artist and I know how we are. We like the limelight and we’re very opinionated. How hard has it been working with art car artists? GUNTER: The artists were great. The fact that they were outgoing and good on camera was a big reason we decided to pursue the film. There’s been some negative blowback, and since this is our first film I have no frame of reference, but I really feel it has been minimal. I pissed off a lot more people in journalism than I have in film. GUNTER: Carlton almost got arrested for Homeland Security violations while filming one day. Sadly, it would not have been the first time. That’s all I can tell you about the specifics because they’re watching. I can tell you that he fled the scene on foot with the camera and without his cell phone, so I had to go looking for him. I was driving around asking the neighbors if they’d seen a dude with a camera run by, and they kept pointing me around the neighborhood, kind of like that scene in “Born in East L.A.” when Cheech is looking for the girl in the green dress. I found him belly up to a bar, with a Miller Lite next to the camera. That was also the most touching moment for me. A + C: I know you guys were looking for archival photos of the Houston parade to include in “Art Car.” Any luck? GUNTER: We’ve gotten a ton of photos and videos from a ton of different people and organizations. They’ll all be listed in the credits, except the ones that might sue us. We’re not listing them. A + C: What’s the distribution plan for your film? GUNTER: We’re going to be submitting to film festivals starting early next year, so no screenings until we see how that pans out. Eventually we hope to have an extended run in Houston, at the very least. AHRENS: It’s been a lifelong dream of ours to show at the River Oaks. It’s a Houston landmark. It’s really cool to see Sundance moving in to help fill the void left by Angelika. You really felt the demand for independent film when Angelika closed. And Alamo Drafthouse came to town and has some really cool events and showings they’ve based around independent film. It’s good to have options. AHRENS: If you say they walked away from it, that means we completed it and they’re not chasing after me, so I’d say that’s a pretty damn good result. Sarah Gish is a conceptual artist and cultural champion who has tooted the horn of many arts and nonprofit organizations for over 25 years. She loves Houston and to connect people and is the Queen of Fun at Gish Creative.